Switching from one team to another has taken up loads of my time… getting involved in all sorts of other activities, even more. I do apologize to my blog and to you, for staying away this long. Sorry. Before even more time goes by, I really wanted to share a photo from last September. The “Koppelpoort” of Amersfoort is a gate with a ‘watergate’ for boats and a land gate for carts. There are loads of pictures of it online. The reason I decided to add this one is I was in the new library, just on the other side of the railway tracks, and I liked the angle. 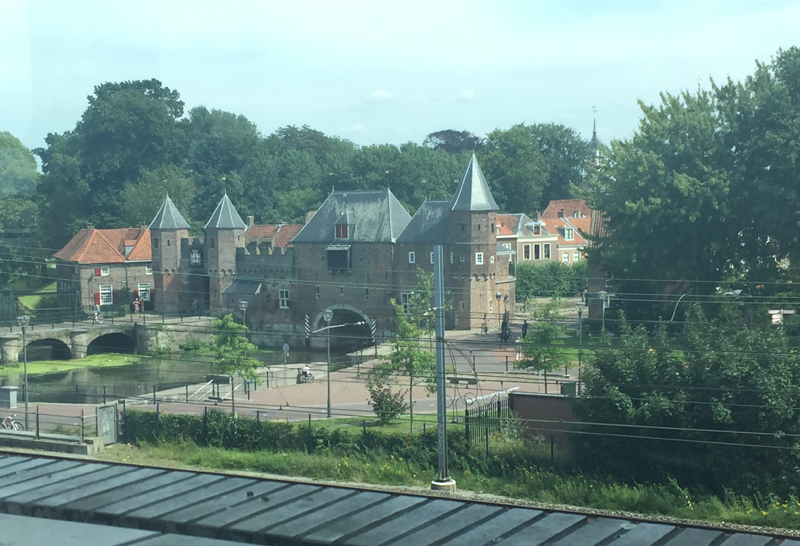 The Koppelpoort as seen from the new library in Amersfoort. It was quite a bright sunny day in September so taking this picture with my phone through the window was a bit tricky. There’s a bit of reflection in the top left. Personally I don’t mind the wires – the library is a nice place for spotting trains while staying warm and dry. For really ‘lazy’ train spotting you can even get a cappuccino plus something off the not-healthy-but-delicious!-menu. The trees you see behind the Koppelpoort are on a piece of land that’s for sale for over a million Euros. You get a large building and a decent-sized yard in the middle of the historic town. Right next to an old church. At some point I will take a picture standing somewhere near the Koppelpoort pointing my phone or camera at the library. I missed a perfect opportunity on my way home a couple of weeks ago – almost perfect, anyway, because where could I stop, park my bike, take out my phone and get that shot without someone bumping into me? However, a winter’s day may yet hand me another great opportunity. With a dark blue sky behind the library and the lamps gently lighting up the interior behind the large windows.